Is the class you’re teaching (or supposed to teach) full of facts and figures? And, there’s no instructor manual or guidance in how to teach it? Are you finding yourself talking through it—talking for hours? (Even boring yourself…) Are you less-than-confident because your Train the Trainer course didn’t prepare you to teach a class like this? Is your audience falling asleep, or, worse yet, getting restless and causing you grief? It doesn’t have to be that way. Pre-requisites: You must have completed Carla’s Instructor Development Workshop (live) or her Train the Trainer course (online). Why? Because you need to have the basic concepts and skills before you take this course. Didn't take Carla's course? Questions about the pre-requisites? Call Carla to discuss. Bottom line: You’ll walk out of this unique course with the skills to take any boring class and make it highly participative, useful, and fun to teach. You’ll get the 3 best methods to use, how to use them, and when to use them to ‘plug them into’ any course at the right time. Why not energize your course, have a better time teaching, and gain business all at the same time? Businesses: Do you have instructors that need more effective methods to teach than ‘talk through the outline’?Contact Carla to help your instructors teach more effectively. 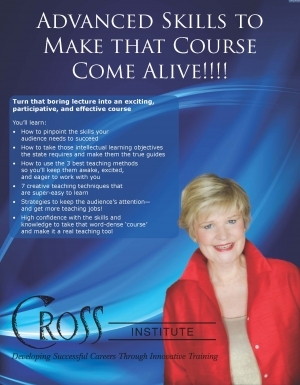 Carla will customize this course for your specific subjects. Call her (425-392-6914) or email her (carla@carlacross.com) to discuss how this can benefit you. Bring: a 1-3 hour course module of the course you want to teach. You'll be working on that course, so you'll walk out with a ready-to-use plan of action for it. The two-day format helps you work on and polish your course between sessions.